Floèm is today aimed at that market niche which independent of a brand’s prestige desires a product which in terms of effectiveness is capable of positioning itself between the classic cosmetic product and the results obtainable through aesthetic medical intervention; it is aimed at a market which puts its trust into a company which considers the binding cornerstones of its core business to be technological innovation, the use of active ingredients in accordance with the highest qualitative standards and the ability to quickly and continuously offer the end user products with effective innovations. In addition, important technical/scientific support is assured daily to the dealer/reseller. 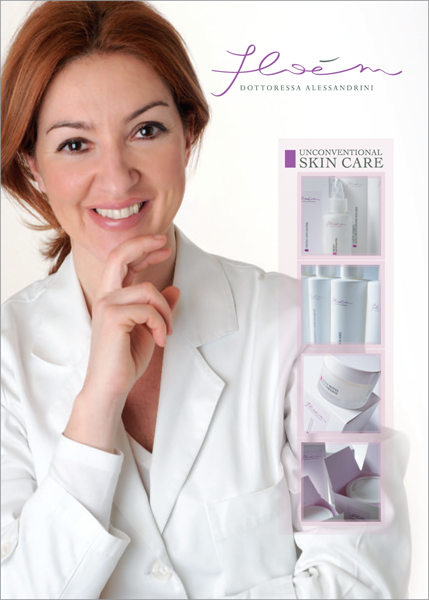 Finally, based on specific needs Doctor Alessandrini gives her clientele the opportunity to offer products that are customized according to functional ingredients and special fragrances. More specifically, she provides the ability to create unique and irreproducible products for a limited circle of people who will have the privilege of wearing her creations: creams, fluids and serums which are able to delineate a sort of separate, boundless universe; fragrances which are capable of recalling or creating sensations, places, images or even guide you to a place of new emotional dimensions.